It's been more than six months since her husband's brutal death, and Julia Ransom is just beginning to breathe again. She loved her husband, renowned psychic August Ransom, but the media frenzy that followed his murder sapped what little strength she had left. Now, after dinner with friends, strolling along San Francisco's Pier 39, she realizes that she's happy. Standing at the railing, she savors the sounds around her-tourists, seals on a barge-and for a moment enjoys the sheer normalcy of it all. And then it comes to an end. Out of nowhere she's approached by a respectable-looking man who distracts her with conversation before violently attacking her and throwing her the railing. If it hadn't been for Special Agent Cheney Stone, out to stretch his legs between courses at a local restaurant, Julia would have vanished into the bay's murky depths. Not only does he save her from a watery grave, but he senses a connection between her assault and her husband's death, and sets out to serve as her protector while reopening August Ransom's murder investigation. Meanwhile, in Maestro, Virginia, Sheriff Dixon Noble-last seen in Point Blank-still mourns his wife, Christie, who vanished hree years earlier. His life, too, is just getting back to normal when he learns of a San Francisco woman named Charlotte Pallack, whose shocking resemblance to Christie sends Dix across the country. Though he knows in his heart that she can't possibly be his wife, Dix is compelled to see her with his own eyes. Once in San Francisco, Dix and Cheney's paths inevitably cross. 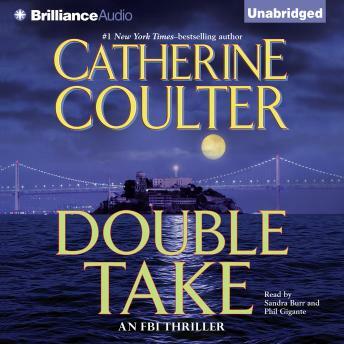 With the help of agents Dillon Savich and Lacey Sherlock, whose San Francisco connections prove essential in unlocking the mystery behind Charlotte Pallack's identity as well as the forces behind Julia Ransom's attempted murder, Sheriff Noble and Agent Stone push deep into a complex world of psychics and poseurs. As the stakes and the body count rise, Savich, Sherlock, Dix, and Cheney fight for answers-and their lives. Could have been me but I had trouble keeping the characters straight in this book and following their history. The narrators did a good job of performing but still the characters sounded very similar adding to my confusion. After a good beginning the book just became boring and tedious to finish. Perhaps an abridged version would have kept my interest.